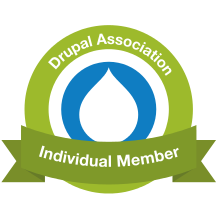 I lead Drupal Commerce at Commerce Guys, try to husband and father, and love Greenville, SC. We were fortunate to have Josh Lockhart (a.k.a. @codeguy) join us at tonight's UpstatePHP meet-up. He is the creator of Slim Framework and author of Modern PHP (should be in your library) / PHP the Right Way (should be in your bookmarks), which basically makes him a leader of the PHP renaissance. I loved PHP the Right Way but hadn't heard of Slim yet, so it was great to hear him present the upcoming 3.x version this evening. Slim currently describes itself as "a PHP micro framework that helps you quickly write simple yet powerful web applications and APIs." Slim provides you with an intelligent router to handle incoming HTTP requests. It implements HTTP request and response objects according to PSR-7 and manages a simple first-in-first-out stack for each route (made up of "middleware" callbacks and the route's own callback) that it invokes in turn to generate a response. I'm easily distracted by new things, so I couldn't wait to get home and put together a quick "Hello, world!" application using Slim 3.x. I then created a small index.php file that includes Composer's autoload file, instantiates a new Slim application object, and registered a simple GET request route. Routes require two parameters, a URI pattern (that may include argument tokens) and a PHP callable that accepts request, response, and argument parameters. And then navigated to http://localhost:8000 to see my handsome message. Note that I'm also a recent phpStorm adoptee, so type hinting my closure's parameters makes for a much nicer development experience. Time to step up! I look forward to playing with Slim some more. In PHPStorm you can also use the doc block @var as an alternative to type hinting. However, it is not as clean looking in closures. Nice! Didn't know that. I think I'll use it inline in a few places in my Drupal modules to type hint objects resulting from entity_load(). © 2014 Ryan Szrama. Contact me. | Site developed by wombats.